Finding your passion can often be a journey through a series of adventures and sometimes even misadventures. Some people discover their passion after many years of meandering through life working meaningless jobs, enduring countless routine tasks and then they hit upon something that really gets them invigorated. This 20-year-old discovered his passion for cooking at a very early age and now he’s poised to tell the world about his love of cooking and share his vision for making meal preparations easier, more efficient and a whole lot more fun. He may be young, but he’s driven to change the way chefs do their jobs, in hopes of saving an industry that he loves. For this reason, we’re featuring Chef Lee Wright as our latest LEAPforLife honoree. He’s definitely Living Enthusiastically and Passionately for Life! Chef Lee Wright has been working in kitchens in the UK for the past five years, but now he’s about to bring his culinary knowledge and passion to TV and online audiences around the world. “I have had to put in all the time possible while running a full time job, many sleepless nights, but I know my passion will lead me to my dream,” Wright said. When he get the funds, Chef Lee Wright has an assurance from America One Network, Dish, DIRECTV, PBS, Ion Media and Legacy TV networks to air 13 episodes of his program. In addition, Chef Lee Wright is also in talks with Foodie TV Network, a television service that uses the Internet to deliver online, on-demand food programs to anyone, anytime for free. “My goal is to give chefs ways to make their working hours more efficient by showing how you can take advantage of some great short-cuts and technology without losing your creativity in the kitchen. I also want to show non-professionals they can make simple, tasty recipes at home, too,” said Wright. 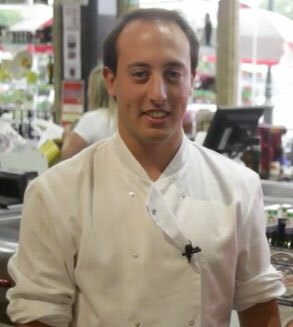 He advocates using the freshest ingredients, shopping locally, and buying basic ingredients that are ready-to-go. He says you can cut down on your prep time by working with your local butcher, fishmonger, spice merchant and local farmer’s markets to outsource some of your prep work. Chef Lee Wright believes that the old ways of doing everything in the kitchen is holding back the industry. He says that many regular people are enjoying the luxury of convenience in their kitchens at home and that chefs in restaurants and hotels must also adopt some of those efficiencies, as well. “You can have a fishmonger filet your fish, you can have a butcher cut and trim your steaks, you can make delicious one-pan meals and in the end you’ll enjoy a more balanced life and less stress,” said Wright. This young entrepreneur hopes his dream will inspire others, too. And he may just be on to something. The U.S. Bureau of Labor Statistics shows that the restaurant industry in the US employs more than 11 million people. The global hospitality sector faces a shortage of chefs. In a recent report, chefs are one of the top 20 professions needed around the world. The top five places with shortages of chefs with five or more years’ experience are Belgium, Canada, New Zealand, Norway and the UK. And it’s not just in fine dining establishments that need chefs. Talented chefs can find jobs in many countries in hotels resorts, cruise ships, foreign branch offices, hospitals, clinics, assisted-living facilities, schools, universities, as personal chefs, and in the catering industry. You can help launch Chef Lee Wright’s TV program by contributing to his crowd-funding campaign on Mobcaster at Chef Lee Wright Season-1 Fundraiser and by checking out Chef Lee Wright’s Website. 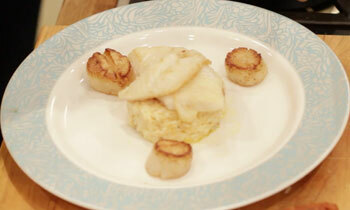 Check out Chef Lee Wright’s Sea Bass with Chorizo Risotto, Vanilla Beurre Blanc Recipe. YUM!